I am a huge fan of geometric patterns in quilts. 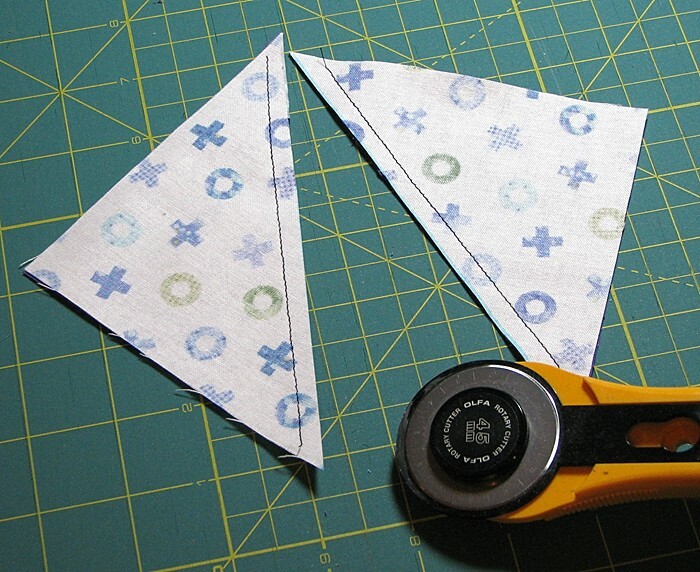 That’s why I love using half-square triangles in my quilt designs. There are so many variations in patterns and secondary patterns that you can get from these blocks. It’s a little like magic to me! 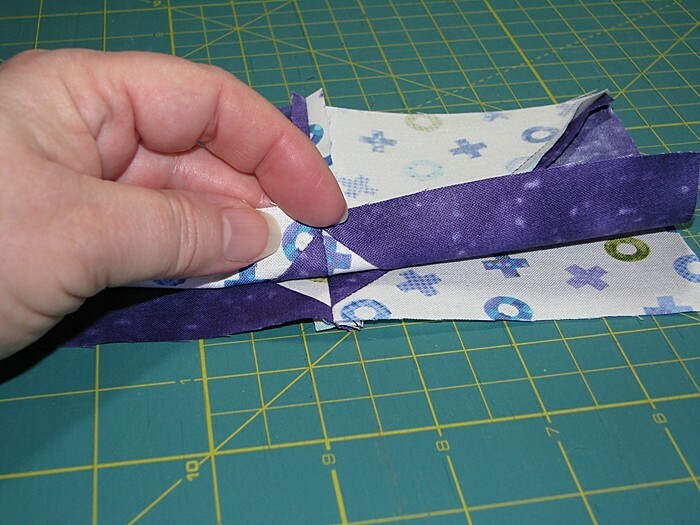 Here are some tips I’ve learned for constructing HST quilts that work for me. 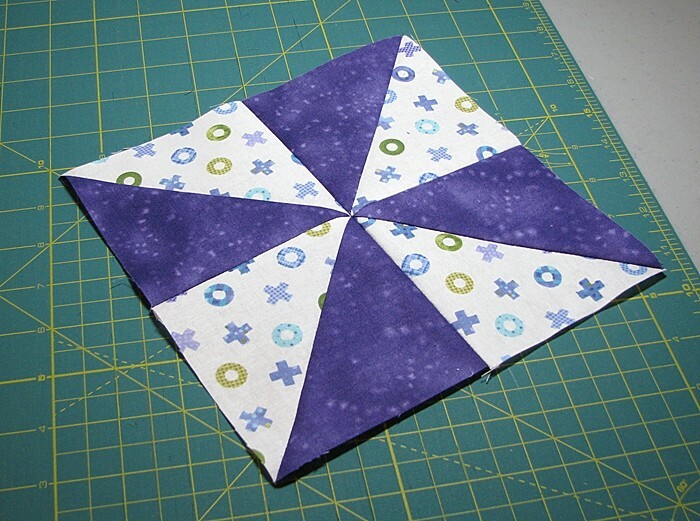 Step 1: Decide what size you want your finished HST square. 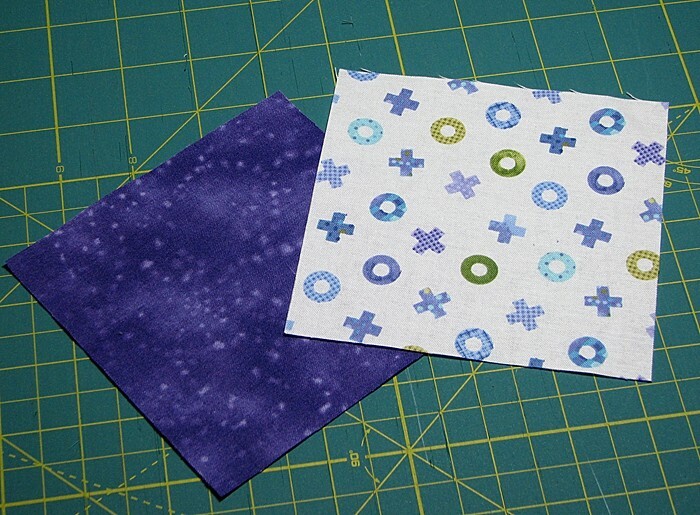 Step 2: Cut TWO squares of fabric one inch larger than the finished size of your HST. 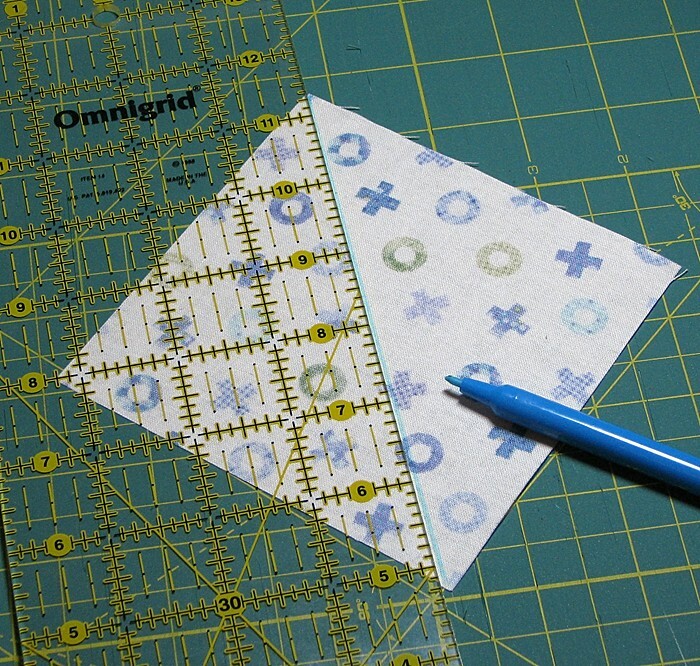 Step 4: Place both squares right sides together and stitch ¼ inch down both sides of the diagonal line. 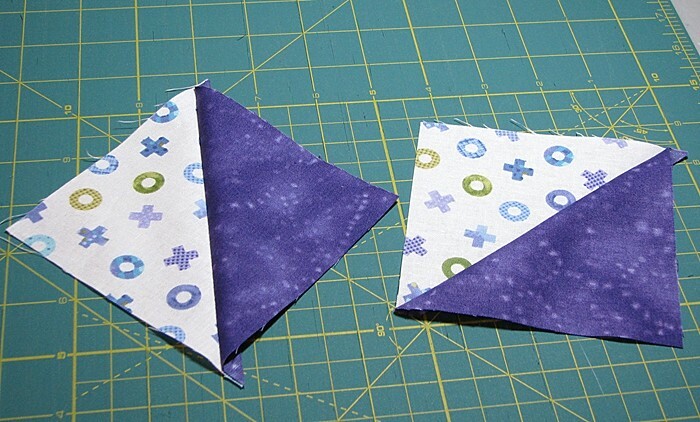 Step 5: Cut along the diagonal line and you’ve got TWO HST squares. 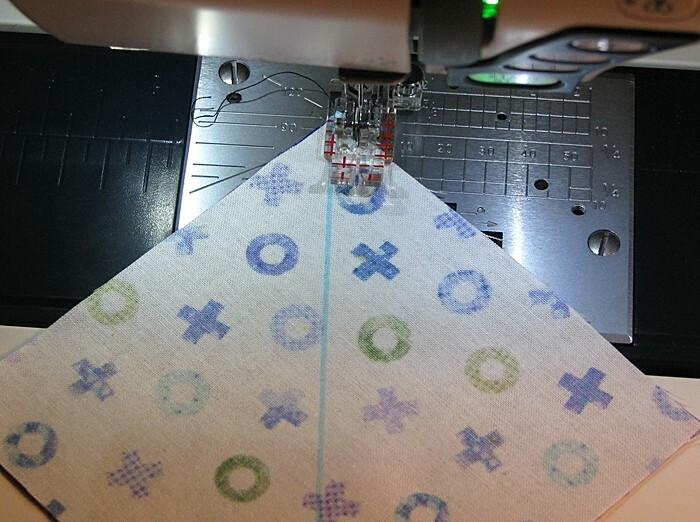 Step 6: After pressing your square open, use a ruler to square up and cut down the over-sized HSTs to the size you desire. 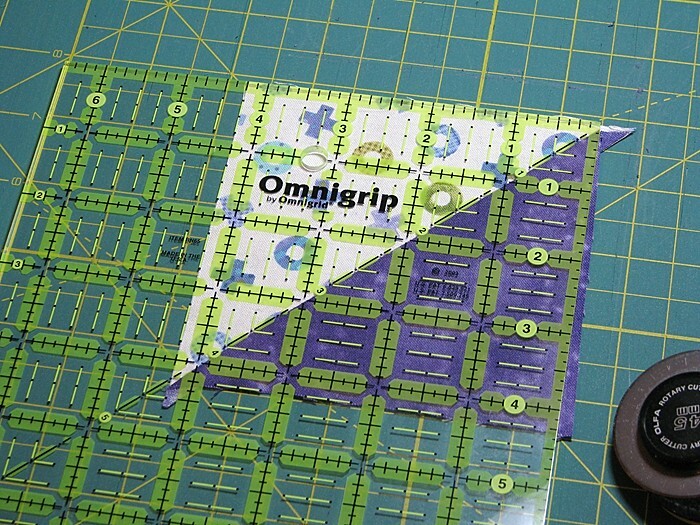 This will help you to be consistent with matching your points as you sew them together. When the majority of my quilt is HST without sashing between blocks, I find it easiest to sew them in long rows then attach each row to each other. For me to keep the sewing order straight I line the whole quilt up on my design wall then take one row down, sew the HST together, press them, then take another row down, sew and press that row and then join the two. Now, I don’t mind getting up and down from my chair to grab the rows because it forces me to move during the sewing process. However others may prefer to stack blocks into piles for each row, labeling them row 1, 2, etc., then placing the stacks near their sewing machine. I, however, need the exercise! I have discovered there is a big debate regarding pressing quilt seams to one side or pressing them open (like in most garment construction). Here is a link to a posting on that topic that made a lot of sense to me. I’ve done both, and on the last HST quilt I made I started pressing the seams to the side but finished the last few rows pressing them open. Pressing open worked much better for me. To line up my points I just place one row of blocks on top of the other and make sure the seam lines lay together, then pin on each side of the seam to prevent shifting while I’m sewing. 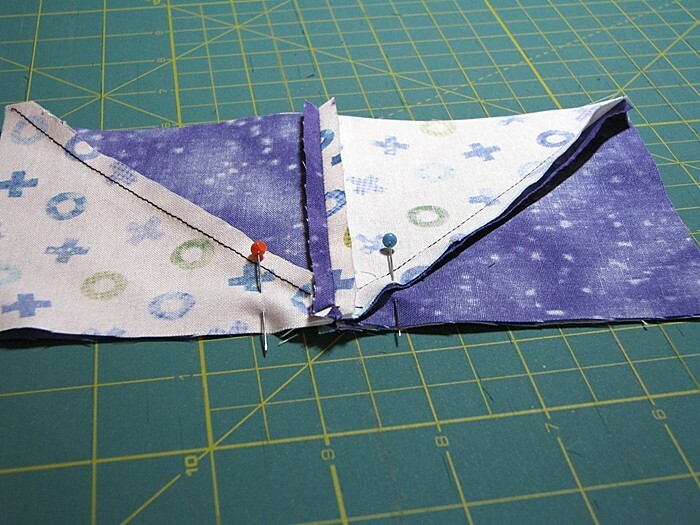 You may notice when I made my HST square I pressed those seams to one side. Since I was using both dark and light fabrics I wanted to keep the bulk of the fabric on the dark side so it wouldn’t show through too much on the light fabric. 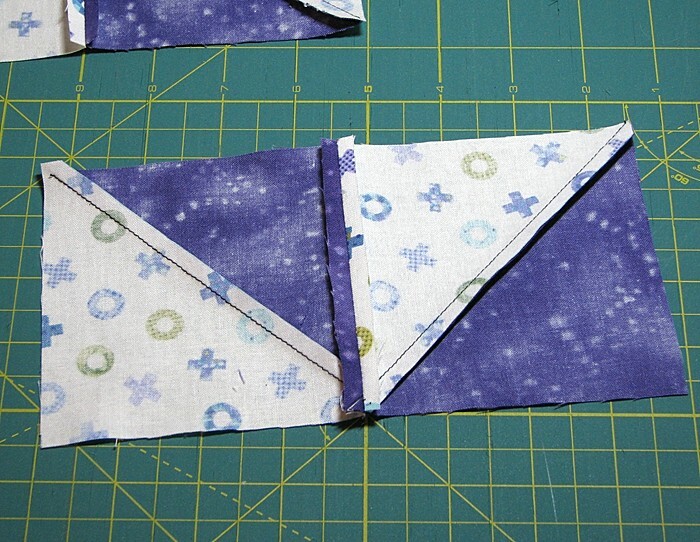 But when I sewed two HSTs together, where I would be lining up my points I pressed that seam open. That was my thought process and it didn’t seem to hinder putting my blocks together. I hope you find any of these techniques helpful! I’n having a heck of a time with my HSTs on the quilt I just started. I started out with the strip method, but either my cutting or my seams have inconsistencies and my four HST blocks are about 1/4” too small. I’ll have to try this method to see if I can get them evened out. I think it’s my seams, and I can’t figure out why they’re so inconsistent when I’m using a 1/4” foot. This is the most difficult thing for me, I am not as precise as YOU! This “lack” of precision is what keeps me away from quilting. I do enjoy your thought process with this technique! For me, patience also helps! When I get to my seam I also hold it down with my finger as I’m sewing over it. But I definitely have to concentrate, LOL.